Papa ate said not bad leh. 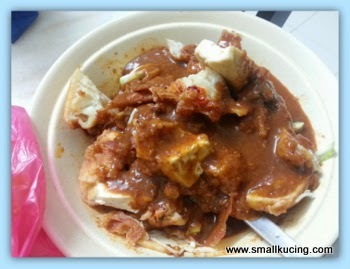 RM5, and the man give quite a lot of Rojak leh. Got one whole eggs instead of half. Also have sotong. 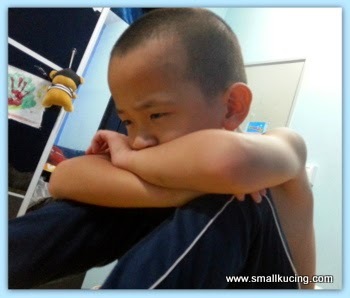 For me...me not moody because can't eat the rojak leh but rather Mamarazzi refused to cook noodle for me as supper. How cool that it was still there. So many thing change so quickly. It must have wonderful food to stay around this long. Quick, send J to Sibu!!! Yo!!! hahahaa... what a priceless moody picture your mom has captured... hahaha... nice, nice.. next time must put it up in your room... the collection of J... I watched the recent HK series, the father snapped a picture of his daughter each day before going to school and pin it up on the family tree leaves.. so cute! I love Indian rojak! There is one van selling Indian rojak outside MBB Damansara Utama but it is not the best so I don't buy. Hi there, Poor little guy... He must have really missed his noodles.....But---your dinner at that 'stand' must have been good... We have people in our country who sell food out of their trucks/vehicles ---and sometimes, it is pretty good. Restaurant people don't like it though since these people don't pay for buildings and all that it costs to have a restaurant.. The Restaurant people don't want them selling food close by their restaurants. I can understand why. Indian rojak? Where's the cendol? I always associate Indian rojak with cendol, coz they are always a pair wherever I go.. There's a van in SS15, always very long queue.. Got Indian rojak means got cendol too, hehe..
Usually when I order Indian rojak, I will say tak mau sayur.. I only love the egg, keropok and tauhu inside.. No vege.. My colleagues always say I'm weird, but my sukak lah, kan? I like banjir gravy too.. After that, down a cup of cendol, wah, heaven! Can fly liao! So what happened to J in the end? No rojak, and no noodles as supper.. How? Milo and "soda peang" lor.. Got ahh? Poor kucing. No noodles can eat rice. Indian rojak. Had it yesterday, only RM4. Poor small kucing. Why mama didnt want give you noodles? I love Indian rojak too..... I heard PJ have quite a few good ones. Yea PJ have many leh. Anay loves Indian Rojak too! Letchumy is also addicted to good ones. There are so many stalls but most of them were disappointing. I must try this stall cos I often visit Happy Gardens. The one inside Taman Desa near the Public Bank (across TM office) is always packed with people! I used to live in the mushroom hut along same street, that's why I know. I was a regular customer too. oh Indian Rojak!! ah, Uncle SK also loves it, but now suddenly realize he has not had it for a very long time!! same like Mamarazzi, last time there's a uncle selling Indian Rojak on his motorcycle outside the school (of course we were not from the same school lah) and especially after school, he will be very busy.. Uncle SK still remember normal one (without egg and anything else) was just RM1.50, add egg will be 50-sen extra.. I know how much he loves noodles..Kesian him. still remember after 20 years, good memory ler! 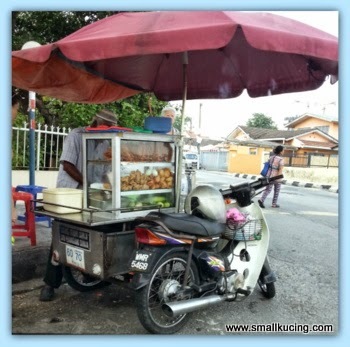 I pass by this place very often but never tried this rojak before. Yalor, kesian Small Kucing, no noodles for supper. Poor little J...must make something for him to eat le!! !